Complete online entry form at batvinc.org/filmfest. Students must submit proof of enrollment (copy of valid student ID or a letter from an accredited school verifying enrollment) with entry fee. Submit entries via downloadable link, DVD, USB Drive, or URL link. Links must remain active and accessible through May 21, 2018. All entries must be submitted by April 30, 2018. 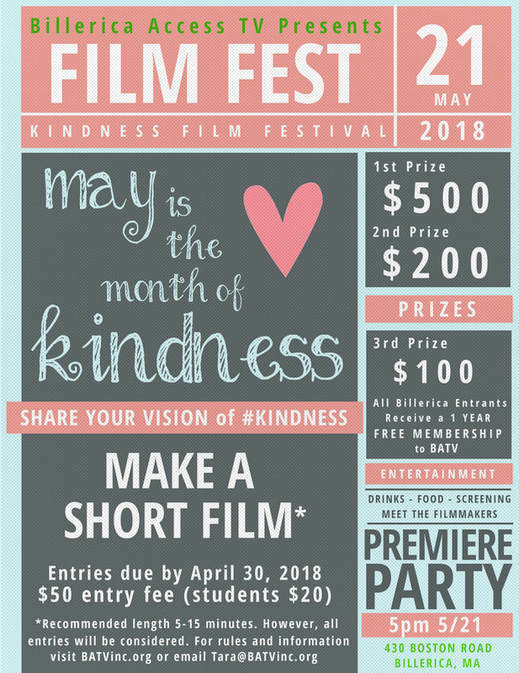 Each entrant will receive one (1) ticket to the 2018 BATV Kindness Film Festival. In addition, entrants who live or work in Billerica will receive a complimentary 1-year BATV membership (individuals must sign an Agreement with BATV Policies & Regulations to activate membership). Membership privileges include training workshops; access to a wide range of equipment and technologies; member events; and professional audio/video production support. Non-English language entries must have English subtitles. Entries must not violate any trademark, copyright, or publicity rights prohibited by applicable law(s). Any entries designed to promote the sale of commercial products or services will be disqualified. Any entries including illegal or otherwise prohibited activity will be disqualified. Suggested length of entries is 5-15 minutes. However, entries of any length will be considered, and will qualify for all awards. The number of films selected will depend on the number of entries. If selected, you will be contacted by email or phone via the information provided on the submitted entry form. Your film will broadcast on BATV local access channels (reaching an estimated 13,000 households). You will receive three (3) additional tickets to the 2018 BATV Kindness Film Festival, where your film will be shown. An awards ceremony will follow, and the winners will be announced. *Additional awards may be presented at the sole discretion of the Festival Judges and/or BATV staff.